Well, the Beijing Olympics 2008 are over. There were lots of amazing sights to see and amazing feats of athleticism achieved. But did you see everything? 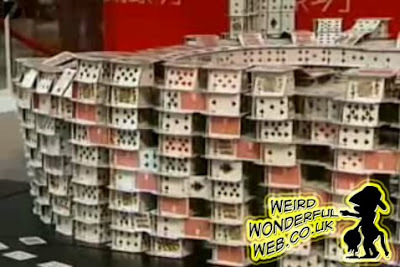 On 17th July 2008 in Hong Kong, Guinness world record card stacker Brian Berg constructed a replica of the Olympic village, including of course the famous "Birds Nest Stadium", entirely out of playing cards. It took him 20 days of building and he used over 140,000 cards. This short video doesn't show the actual constructing of the structures but gives you an overall view of how impressive it looks.